We don’t own a car, lucky for us we live in a very flat city that is perfect for biking. 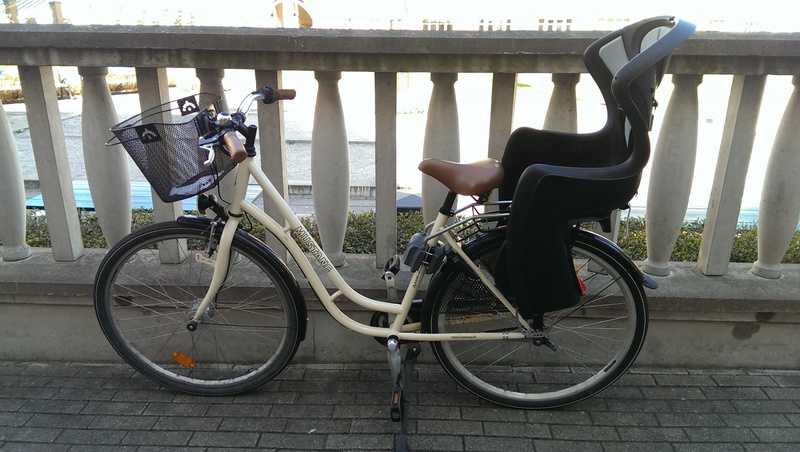 I have a fairly new bike that works great but it’s a bit dull. So I decided to give it a make over, pimpin my ride if you will. It’s a fairly large project and this is the first part of it. The basket that was included was not a good one. It got bent easily and wasn’t very sturdy so I looked for a new one. It didn’t need to be fancy since my plan was to sew a cover for it. I found the perfect one in a small bike shop close to home, a traditional rectangular one you just hang on the bar. 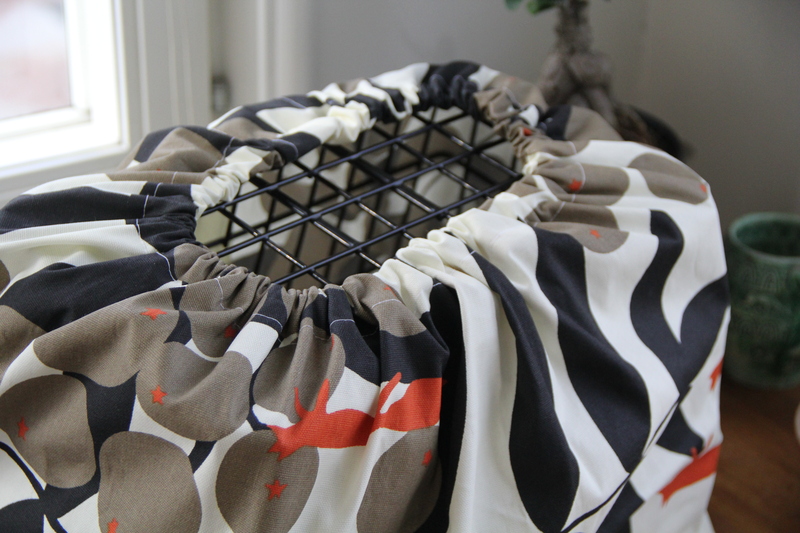 Here is how I did my cover: Measure around you basket, add seam allowance. I used some sort of oil cloth fabric for mine since I wanted it to be on my bike all the time and stand the rain. 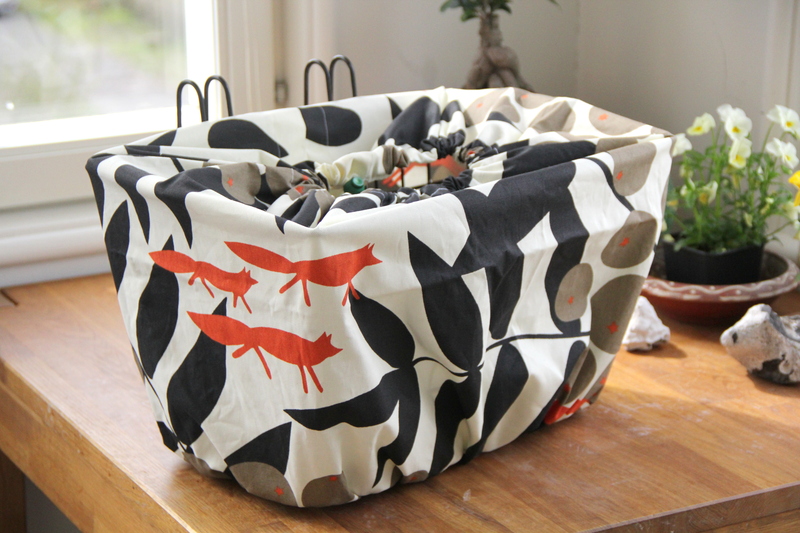 My oil cloth wasn’t the kind that is very glossy because it’s hard to sew ( I think anyway). It lookes more like canvas that has been treated to handle moisture. Anyway, sew it together, flatten the seam ( I didn’t dare to use the iron for this). 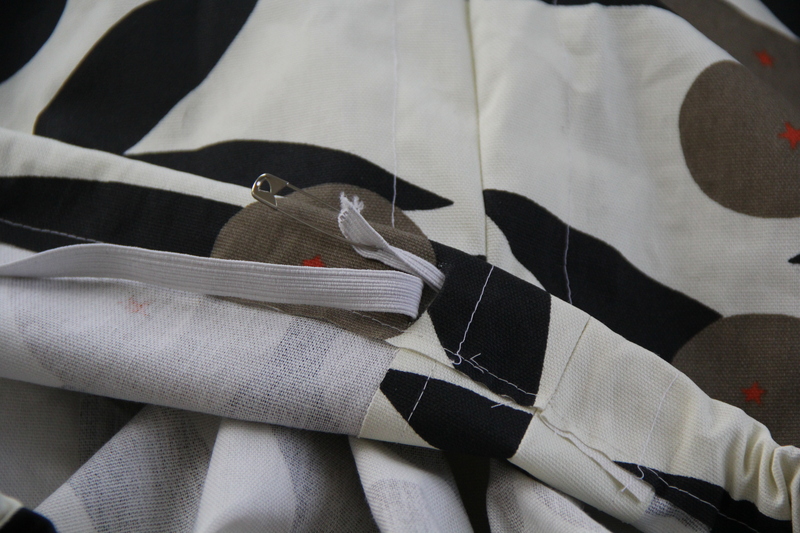 I added one stitching on either side to hold the remaining fabric in place and for it to look good! On the bottom side I sewed a canal, about 1,5 cm wide. Thrue a small hole in the canal, insert you elastic band attached to a safety pin and go all the way round, back to your point of entry. Pull you elastic to scrunch up your fabric the way you want it, tie the ends together. You might want to try this out on the basket. Mine turned out like this. Take the cover of again and sew a canal on top. Again, mine is about 1,5-2 cm. Leave a small hole. This time I opted for a drawstring solution since I want the cover to stay open sometimes, but be able to close it when I need to. The only thing remaining was to make holes for where the hangers go. Put the cover on again, mark where the holes should be, cut with your scissors and sew around the holes, like you would a button hole. This is how it all turned out, I am terribly pleased! It looks great, it will protect my things from rain and also from people trying to steal the stuff I have in there – hands off! Next time I will decorate the frame – so excited!